Pinterest is a content sharing website that allows its members to share images, videos and other objects they like to their pinboard by “pinning” it! This is a great website with a unique idea and has made its place in the hearts of millions of users and thus the social media marketers. It definitely makes sharing easier and allows you to meet people from around the world who share your interest. Apart from being a really fun place it is also an effective social media marketing service. Do you want to use Pinterest more effectively and advantageously? If yes, then keep on reading as today we have a list of 10 Amazing Pinterest Tools To Help You Get The Best Out Of It. Check them out and pick the ones that suit your needs the best. This one is a great extension for Google Chrome that allows finding more related images and details of an image you found on Pinterest. Add this extension to your browser to get an additional ‘Search’ button on hovering over any photos on Pinterest. Simply click that button to see the related Google’s search results for that photo! What will you do if you wish to pin the screenshot of the entire website, instead of a single photo? Well, the answer is use Snapito. Snapito is a really handy tool that allows screengrabbing an entire website. You can also get a timestamped screenshot of a website using this tool! 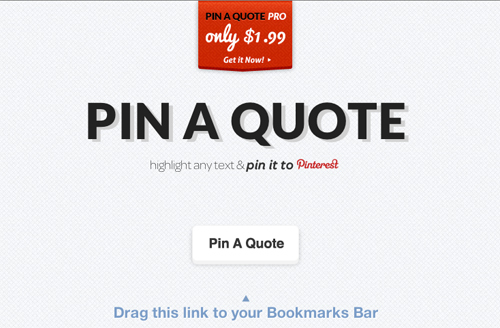 As the name suggests, this tool lets you post quotes to Pinterest easily. All you have to do is to first of all get its bookmarklet from its website by dragging the button ‘Pin A Quote’ to your browser’s bookmark bar. Then you can pin any quote simply by highlighting the text you like on any website and then clicking on the Pin A Quote bookmarklet. You will be presented a form, fill it and post the quote to Pinterest. 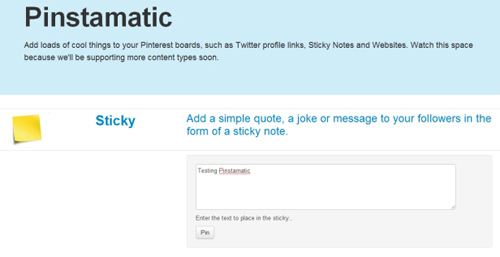 Pinstamatic is a great tool gives you the ability to pin Twitter profile links, links of websites, and ‘Sticky Notes’ to your boards. This unique tool is expected to support more content types soon, so you will be able to add a variety of different types of content to make your board even more interesting. This one is a really useful tool that helps you measure your Pinterest influence. Its ‘Analytics’ lets you view your total pins, repins, likes, followers etc. It provides an overall score of your pins. It displays its information about your most popular pins and boards by using easy to understand charts and tables. If you want to know how popular you are on Pinterest, then you should definitely give this tool a try! Pinerly is presently in beta, but it is expected to be a really comprehensive Pinterest analytics tool. So it is always a good idea to add your email address to the waiting list. This awesome tool will have the ability of measuring the clickthroughs, likes and repins for ‘campaigns’. Brands and businesses will find this tool to be really helpful in getting them feedback about their campaigns. Pinpuff is an awesome service that allows measuring your Pinfluence, that is, how popular you are on Pinterest. It also tells you the value of your each pin. Simply go to the website, enter your email and Pinterest username and the ‘Calculate your Pinfluence’. Then this service will show you your total score based on your reach, activity and the popularity of your pins. It also tells you the estimated value of your pins and referral traffic. This tool is quite similar to Snapito as it allows pinning an entire screengrab of a website, instead of just a single photo from it to your board. It is a really easy to use tool and you should definitely give it a try. Recent Activity Expander is a fabulous extension for Google Chrome. As the name hints, this extension lets you view who followed you or re-pinned your content recently. It simply adds a bar on the left side of your Pinterest page, which shows all this recent activity information. Simply add this app from Chrome Store and get started! 1. ‘Pin to Pinterest’ by right click — Simply right-click whatever you wish to pin, select ‘Pin to Pinterest’, fill up the detail form and Voila! The content has been posted. 2. Photo zooming — This feature makes viewing photos a breeze. Simply hover over any photo with your cursor to enlarge it, without even clicking on that photo. 3. Popular Pin Dropdown — This button is added to the top-right corner of your browser by this extension. By clicking on this button you can view the latest popular content on Pinterest without even loading the website. Great post – knew about some of these tools and using them but great to hear about the other ones. Cool! This list includes a few I hadn’t heard of. Awesome list bro, this is very useful stuff, i like your work. These are great tools! The only one I was familiar with was Pinpuff, so all of these other ones really come in handy. Thanks! !